The ACT Family Tournaments are on for 2019 - join us for a weekend of boardgaming fun at LFG Retail on 4 - 5 May 2019! Online ticket sales are now open! Purchase your tickets online to secure your place at $15 for Settlers of Catan and Ticket to Ride, and $10 for Rummikub. 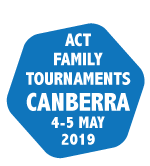 The 2019 ACT Family Tournaments will be held at LFG Retail, Shop 3, Primmer Court, Kambah Village. Please see the map below. Win first place in your tournament to be eligible for FREE entry to the 2019 Australian Championships!